The meeting point for this tour is at the west entrance to the city – called Pile gate, just in front of the main tourist office and near the main bus station. On request, we can organize a transfer for you to Pile gate from your hotel or other destination. 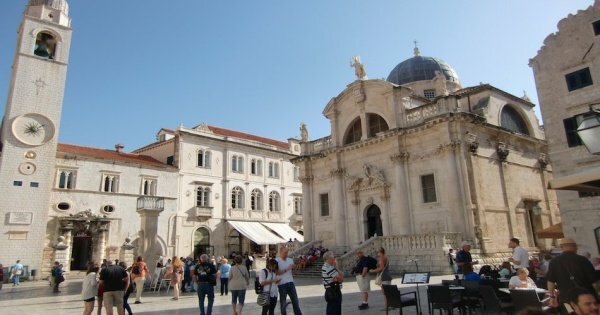 From Pile, we start the walk through the old town, cross the main street Stradun and get an overview of the most important churches, monasteries and museums in Dubrovnik. During this orientation tour, you will inspect the history and the development of Dubrovnik town since the 7th century till today. After the tour you will know who and when built the city walls of this beautiful town, where the main churches are, what monasteries and museums you should visit, who lived in Dubrovnik and how is the economy today. I will be at your disposal also after the tour, to provide answers to your questions and give you tips about how to spend your time in Dubrovnik the best way. Thoroughly enjoyable, very knowledgeable guide, fluent English. Our guide was a “native” of Dubrovnik. He was witty, informative and very knowledgeable about his city, and spoke excellent English. We were very lucky that our group was only 4 people it meant we had a very personal overview of the lovely Old Town by our tour guide. He was very entertaining and we enjoyed his knowledge on the history and his quirks as well. This time of the year is superb it’s lovely and warm with clear blues skies. Really glad we chose this tour especially before we headed out on the wall walk. Recommend the tour 100 percent very enjoyable. Good overview of the history of Dubrovnik. Our guide made the tour fun and interesting. Well worth doing. Gives you a feeling for the history of the town and the area. The walking tour is fantastic because you get to really understand the history of the Old Town. Our guide is actually from the Old Town, so her knowledge and enthusiasm was second to none. Nice enthusiastic guide. A lot of knowledge and personal experience. Small group. Definitely walk the walls to get a feel of the city - We did a guided tour for this which was invaluable in getting our bearings for our later explorations.